So extraordinary it almost defies description. All photos were taken by Luke Massey and Katie Stacey at Jaguar Lake in late September 2017. Once in a century, a wildlife site appears that is so extraordinary it almost defies description. Jaguar Lake is such a place. It offers all of the top, most spectacular, most iconic mammals of tropical South America, all cheek-by-jowl. All you have to do is sit and wait, sipping iced drinks while keeping cool in the tropical heat by wearing our unique, custom-made, ice vest. Researchers led by Dr. Charles A. Munn, our scientific advisor and one of the world’s leading conservation biologists, not only discovered this site but discovered why it draws such an amazing cast of thirsty characters. During the driest period each year in the Pantanal, namely from mid-July to mid-October, Jaguar Lake is the only clean body of water in an area of parched savanna and woodland covering 30 square kilometers (12 square miles). Map: Arcana Mundi Expeditions. Jaguars of Brazil’s Pantanal. Jaguar Lake is set deep within the southern half of the 17,000-hectare (42,000-acre) Santana Ranch, 12 kilometers (7 miles) south of the Piquirí River. Because of the grassy margin around the lake’s entire edge, the mammals are highly visible, creating perfect photo opportunities. A parade of charismatic vertebrates. Photography: Luke Massey and Katie Stacey. 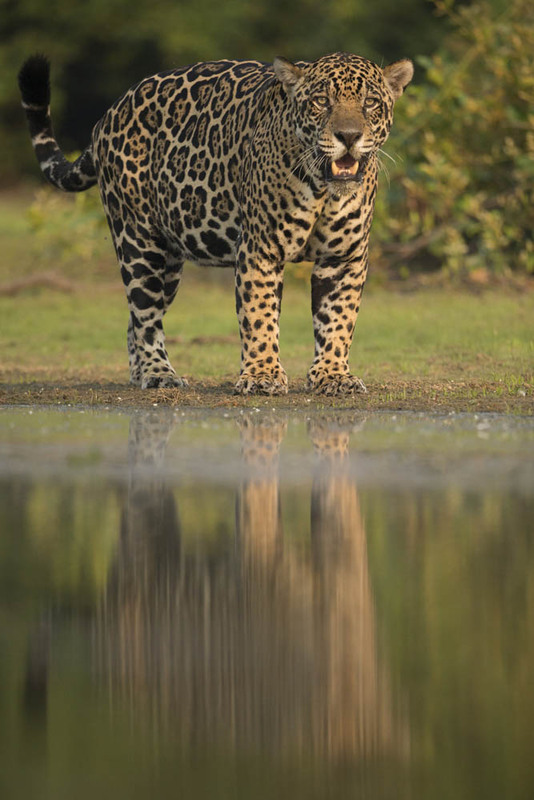 Jaguars of Brazil’s Pantanal. The lake’s still, dark surface makes for mesmerizing reflections of the parade of charismatic vertebrates that come to the water’s edge daily during the period from mid-July to mid-October. Interactions between Jaguars and other iconic mammals. 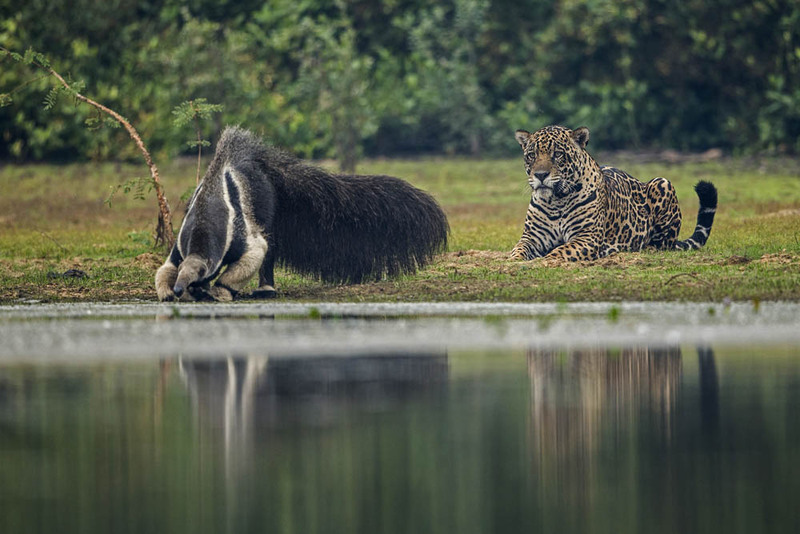 On most days, photographers record interactions between Jaguars and other iconic mammals, such as Tapirs, Giant Anteaters, Marsh Deer and White-lipped Peccaries. Wildlife habituated to human observers. All of the thirsty wildlife is not only present but already habituated to human observers. 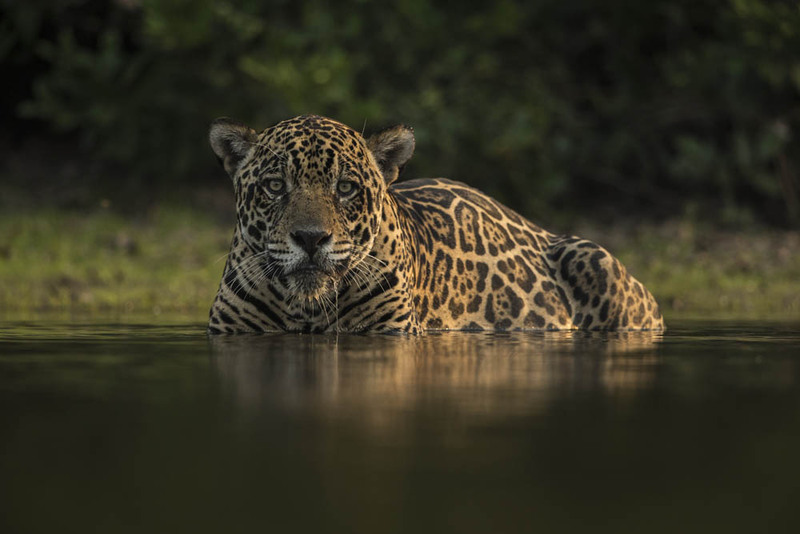 Thanks to years of protection offered by a partnership between our scientific advisor and the visionary ranch owners, you will be able to photograph Jaguar Lake’s spectacular mammals as they engage, unafraid, in their natural activities. 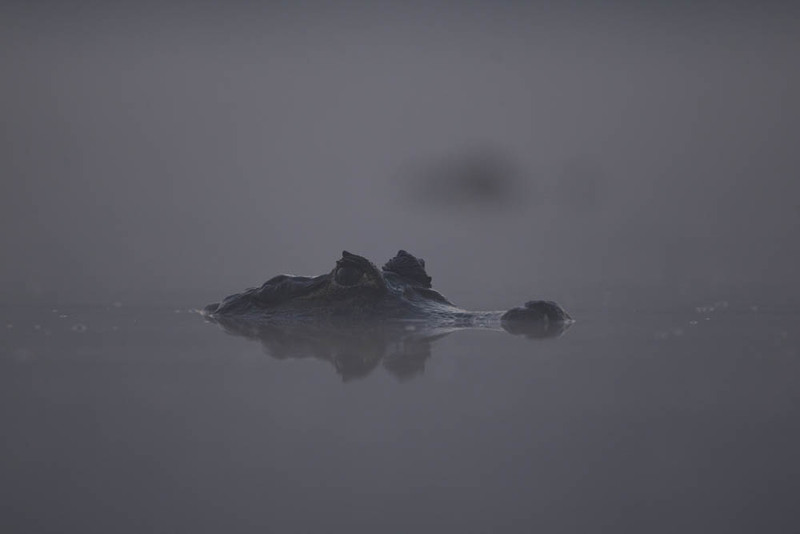 This unique wildlife experience is for our guests only, as the lake sits in the middle of the Santana Ranch’s 17,000 hectares (42,000 acres), and our scientific advisor has an exclusive concession to develop and manage ecotourism on the entire property. Each visit to Jaguar Lake is restricted to a limited number of guests, typically four to six. For the most discerning, demanding photographers. We are taking reservations from a select few of the most discerning, demanding photographers to visit this land-locked lake and lagoon during the period from mid-July to mid-October 2019. You will be accompanied by your private guide, but transportation and the floating blind may be shared (most guests will be alone or with one or two other couples or singles). 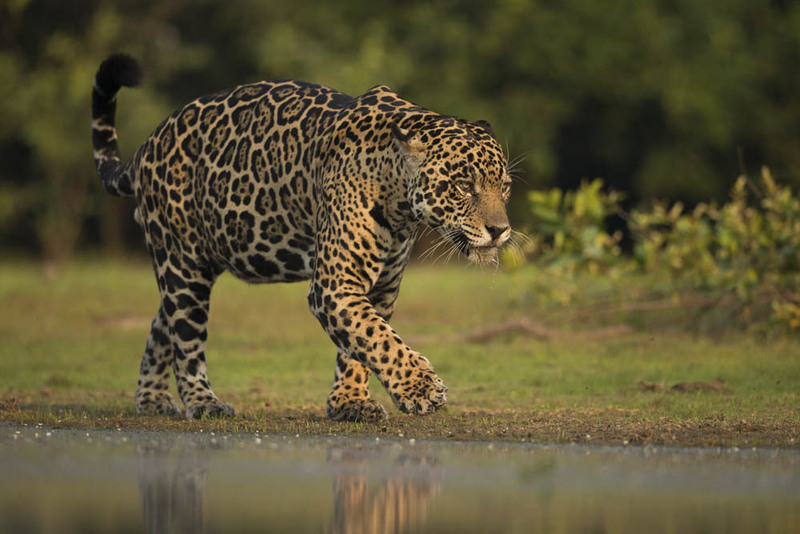 Jaguar Lake & The Lost Lagoon begins with our Jaguar Extreme expedition, during which you will spend four days searching for Jaguars along the shores of a labyrinth of rivers and spend four nights in a Jaguar Suite aboard the Jaguar Flotel. Afterward, journey to the newly-discovered Jaguar Lake and the Lost Lagoon to search for the most iconic animals of tropical South America for two days and two nights, sleeping in a secure tented camp (professional photographers may want to add a third day and night). On the first and last night of this ultimate Jaguar expedition, explore the SouthWild Pantanal Lodge, one of the birdiest locations on the planet, observing the amazing creatures of the Pantanal, including Giant Otters, Ocelots, Tapirs & Hyacinth Macaws. While we recommend booking Jaguar Lake as an extension to our private Jaguar Extreme expedition. Jaguar Lake & The Lost Lagoon may be booked independently. The cost of Jaguar Lake is $1,270 per person per night, based on two guests sharing a tent. The single supplement is $120 per night. If you book separately, there is an additional cost of $770 for a privately-guided, round-trip transfer by vehicle and boat between Cuiabá and Jaguar Lake. Travel time is eight hours each way, with many photo opportunities along the Transpantaneira Road, the Cuiabá River and the Piquirí River. Kindly note that accommodations in the tented camp are comfortable but rustic. An intial payment of 50% of the land price is requested to guarantee a reservation, with the balance payable two months before tour commencement. The standard form of payment is by wire transfer. If you prefer to use a credit card, there is a 3% surcharge, which is our cost of processing such transactions. Travel insurance is not included, and there are no refunds. Therefore, we strongly recommend that you purchase travel insurance by Travel Guard to protect yourself and your investment in the tour. No air tickets are included, nor do we sell any. The flights are best arranged through your international carrier or Expedia. Day 1: São Paulo – Cuiabá – SouthWild Pantanal Lodge. Your guide will meet you at your hotel. Depart from Cuiabá at 8 am for a 3-hour-long drive in a closed, air-conditioned van to the SouthWild Pantanal Lodge (SWP) . Trip Advisor lists the SWP as the #1 wildlife lodge on the entire Transpantaneira Road. Stops to observe wildlife along the Transpantaneira. Arrive at the SWP in time for lunch, and begin your wildlife explorations this afternoon. Overnight in the SWP. L, D.
Day 2: SouthWild Pantanal Lodge – Jaguar Flotel. Breakfast. Observe abundant fauna around the lodge, breakfast and 7 am departure in an open-sided, roofed safari truck or a closed, air-conditioned van to the end of the road at Porto Jofre. Stops along the Transpantaneira to see wildlife, with arrival at the end of the road by 10 am. Then take a search boat for the half-hour, 13-kilometer trip upstream on the Cuiaba River to the Jaguar Research Center Reserve and the Jaguar Flotel. Lunch. This afternoon, a 4-hour boat outing. Dinner and a scientific lecture. Overnight in a Jaguar Jaguar Suite. B, L, D.
Days 3, 4 & 5: Jaguar Flotel. Breakfast. This morning, a 4-hour boat outing in search of Jaguars and Giant Otters on some of these river channels: Three Brothers, Black Channel, Cuiabá and Piquiri. Lunch. This afternoon, a 4-hour boat outing. Dinner and a scientific lecture. Overnight in a Jaguar Suite. B, L, D.
Day 6: Jaguar Flotel – Jaguar Lake. After an early breakfast, depart the Jaguar Flotel at 6:30 am. Boat one hour upriver to the headquarters of the Santana Ranch, looking for Jaguars along the riverbank. Continue one-half hour by truck to the Lost Lagoon to begin a catarmaran trip up and down the lagoon this morning. Like Jaguar Lake, it is one of the few water sources for thirsty animals during the dry season. Afterward, make the half-hour drive over to Jaguar Lake for lunch at the lake’s tented camp. Afternoon on Jaguar Lake, observing the most active ends of the lake for Jaguars, Tapirs and other mammals. The edges of Jaguar Lake are a perfect photo background for any wildlife that comes to the lake, including beautiful, photogenic water birds, such as small flocks of Roseate Spoonbills, Black-necked Stilts, Jabiru Storks, flocks of White-faced Whistling Ducks, Green Ibises in good light (showing all of the strange and spectacular mixtures of iridescent greens and copper hues on their plumage) and Juvenile Rufescent Tiger-Herons. Overnight at Jaguar Lake Tented Camp. B, L, D.
Day 7: Jaguar Lake. Breakfast. Visit the Lost Lagoon in the morning and Jaguar Lake in the afternoon. Overnight at Jaguar Lake Tented Camp. B, L, D.
Day 8: Jaguar Lake – SouthWild Pantanal Lodge. Breakfast. Depart Jaguar Lake by 10 am and arrive at the ranch headquarters by 11am. Boat downstream to the Jaguar Flotel for lunch. To complete your Jaguar Extreme expedition, take a search boat for the half-hour, 13-kilometer trip downstream to Porto Jofre. Upon arrival, begin a road transfer to the SouthWild Pantanal Lodge in an open safari truck or a closed, air-conditioned van. Afternoon 2-hour motorboat outing on the wildlife-rich Pixaim River and a pre-dinner visit to the Ocelot Tower. 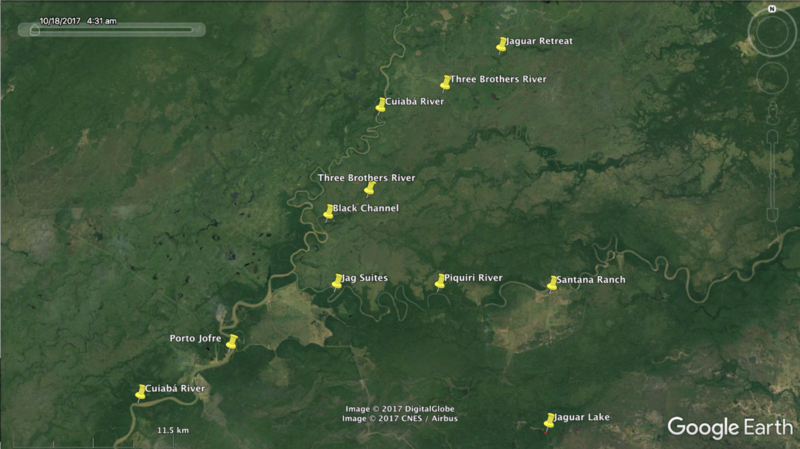 B, L, D.
Day 9: SouthWild Pantanal Lodge – Cuiabá – Your Next Destination. Observe fauna before returning to Cuiabá in a closed, air-conditioned van, with arrival at the airport in time for your departing flight. B, L.
Note: Your guide may vary the timing and duration of visits to Jaguar Lake and the Lost Lagoon in order to maximize wildlife sightings. Clearly, Jaguar Lake has it all. In 2016 and 2017, researchers led by Dr. Charles A. Munn, one of the world’s leading conservation biologists and Arcana Mundi Expedition’s scientific advisor, discovered that in July through November, an attractive, remote, 400-meter-long by 150-meter-wide, triangular lake was attracting Jaguars, Tapirs, Giant Anteaters, Marsh Deer, both species of peccaries and a host of small mammals as well as hundreds of large water birds. 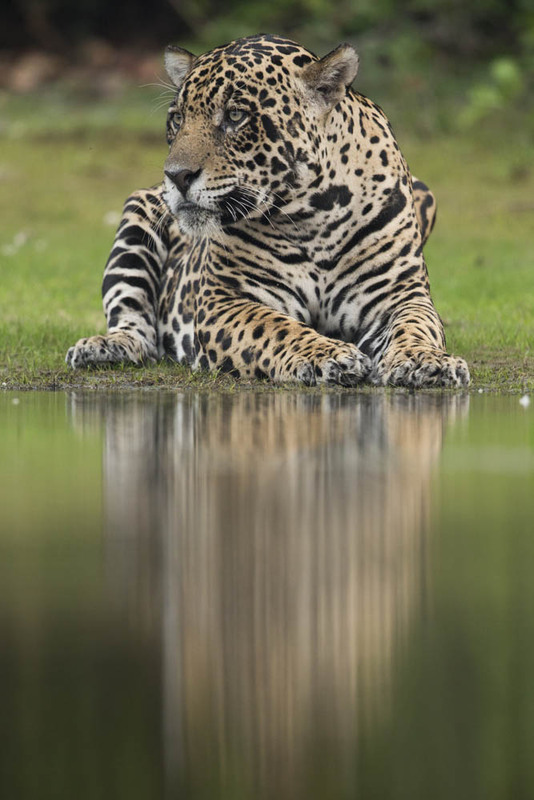 He named this mirror-like, blackwater oasis “Jaguar Lake” due to the striking imagery of the big cats that two important collaborators, conservation photojournalists Luke Massey and Katie Stacie, obtained during 12 days there in September of 2017. Then, Emmy-winning wildlife cameraman Lawrence Wahba spent 5 days at the lake in early October of 2017. Even after some of the first significant rains, he had spectacular Jaguar visits on four of those five days. From late July through early November of 2018, Wahba came back to the Santana Ranch and particularly to Jaguar Lake with his camera crew from Smithsonian TV to make a documentary about the lake. The 52-minute special is scheduled to appear on international TV in the first half of 2019. To research the fauna at this important dry season water hole, in 2018, Dr. Munn opened an exclusive, simple tented camp located at a mere 100 meters from the lake edge. Smithsonian TV channel placed a film crew at the lake for a total of a month, recording Jaguars drinking and bathing in the lake on one of every three days, and 600-pound Brazilian Tapirs (the largest land animal in South America) bathing at the lake on three out of four days. A parade of other fauna came to the lake, and not only the Smithsonian TV crew, headed by Lawrence Wahba, but a few select guests enjoyed the surprising wildlife that showed up at the lake. Indeed, Munn was lucky enough to see a big Jaguar bathing in the golden afternoon light on 30 August. The previous afternoon, he found himself walking only 25 meters behind a mother Jaguar with cub … this at 40 meters from the walk-in tent where he was sleeping. Our expedition will spend two or three nights at this tented camp to see what wildlife comes to the lake. Most of the wildlife observation will take place from the 14-foot by 16-foot floating blind, complete with double-canopy roof. This floating blind has four sturdy, metal, drop-down legs — one on each of the four corners — and special jack devices on each leg to lift each of the corners of the blind by a few inches. These four legs with jacks completely stabilize the blind. These legs can be retracted quickly so that the blind resumes floating, and then our crew poles us like gondoleers in Venice, slowly pushing the blind silently to other parts of the lake. You can never be sure which end of the lake will produce Jaguars, Tapirs, and other interesting mammals, so being able to move to the action is key. As far as we know, this large floating blind with deployable stabilizer legs is the first such floating blind in history, though already Smithsonian TV camera crews have requested that we make more for them. The guest tents are very simple, but they hold either two twin beds or beds made into one king bed, and the inside of the tents features both a large, moveable pedestal fan and a portable air conditioner unit powered by generators located far from the tents. All of the guest tents are inside an eight-foot-high, barbed wire perimeter fence, and the wire strands are placed only four inches apart, making it impossible for a curious Jaguar to approach the tents. We do not believe that the Jaguars would approach the tents, but we see little point in testing that hypothesis with our team members and our guests. Dr. Munn’s tented camp is the first and only one to operate in “Jaguarland”, which is the name that he coined in 2005 for the 1% of the Pantanal that harbors 65 habituated Jaguars that live at the highest density ever recorded for these big cats. In fact, this camp at Jaguar Lake is the fourth tented camp that his team has operated in Jaguarland, and we have to say, after certain experiences with Jaguars threatening us in the daytime in one of our previous camps, we now firmly believe that a barbed-wire perimeter fence is quite a good idea. Each tent also has a simple, odorless, dry toilet. As we are fortunate that Jaguar Lake has almost no mosquitoes in the forest of the tented camp during the dry season, we decided that it was easy and logical to offer private shower stalls for each tent in a location inside the perimeter fence but a few meters away from each tent. The three nights sleeping at Jaguar Lake will be exciting and unpredictable, much like the proverbial “box of chocolates” mentioned by Forrest Gump. We never know exactly what we will get. Even on days that Jaguars or Tapirs or Giant Anteaters do not appear, the lake is full of beautiful, photogenic water birds, and the golden early and late light, the dark water color, the green, grassy edge of the lake, and the green bushes and trees that ring the lake edge all make for perfect photography of every species of mammal and bird that shows up. Of course, the lake also contains hundreds of caiman, which are the favorite prey of the Jaguars. New in 2019, we will also offer 2- to 3-hour-long, low-speed, birding and photography outings on a 3,100-meter-long, 50-meter-wide blackwater lake that we are certain has not been navigated by a human for at least 200 years, if not 500, and perhaps never. This isolated lake, which we have named the “Lost Lagoon,” is buried deep in the forest of the interior of the Santana Ranch, fully seven kilometers from the banks of the Piquirí River. 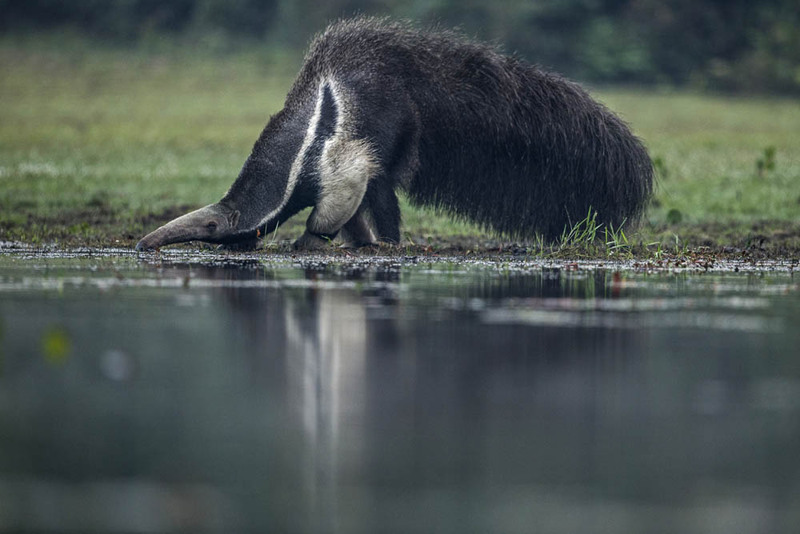 Only on 14 October 2018 did Munn and conservation biology professor Everton Miranda from UNEMAT, a local Brazilian university, carry out what is almost certainly the first navigation of this peaceful, wildlife-rich private lake. The team used a newly-imported, inflatable, two-person kayak. In 2019, our guests will explore this lake using electric-motor-powered, 10-person catamarans that we will build ourselves out of two fiberglass canoes with a platform in the middle. These small, electric catamarans will be approximately catamarans number 30 and 31 that our teams have built over the years for use in lakes and slow-moving rivers in the Amazon and Pantanal. After three seasons, Dr. Munn and his researchers now know that the 17,000-hectare (42,000-acre) Santana Ranch has eight lakes or waterholes that draw Jaguars, Tapirs and other large mammals, and some draw Maned Wolves. Currently, they are working out the best way to monitor all eight bodies of water. © Inka’s Empire Corporation 2017. All rights reserved.